An area of law dealing with family relations, including: annulment, divorce, adoption, paternity, custody, and support. In California, several factors are taken into consideration to determine if temporary, short-term, long-term or permanent partner or spousal support should be paid and how much. The Court will use a variety of important factors to calculate the amount and terms of spousal or partner support, including when or if it ends. The above are examples, but there may be other reasons an annulment is an appropriate remedy. Some marriages are void from inception, other marriages are voidable. In cases of voidable marriages, there are statutes of limitation for filing an annulment case. Additionally, you will need to present and prove the reasons for filing an annulment with the Court. In California, either parent can have custody of the child (ren), or the parents can share custody. The judge makes the final decision about custody but usually will approve the arrangement (the parenting plan) that both parents agree upon. If the parents cannot agree, then the judge will make a decision at a court hearing. For family law matters such as these, child custody attorneys provide a valuable source of guidance for the parents and child (ren). If you and the other parent agree on custody and want a court order that either of you can enforce if one of you violates the agreement, it can be beneficial to speak with a child custody lawyer and then turn in your agreement to a judge. The judge will probably approve the agreement, sign it, and it will become a court order. A dissolution of marriage, commonly known as a divorce, is the termination of a marriage by legal action generally started by the filing of a petition with the court by either spouse. In addition to legal separation and annulment, a dissolution of marriage is the most common way to end a marriage or registered domestic partnership in California. It is not necessary for both spouses or both domestic partners to agree to end the marriage. Either spouse or partner can decide to end the relationship, and the other spouse/partner, even if he or she does not agree, cannot stop the process. If a spouse or domestic partner does not participate in the divorce case, the other spouse/partner will be able to get a “default” judgment, and the dissolution of marriage will proceed. The substantive issues in a dissolution of marriage are the division of property and debts accumulated during the marriage, child custody and visitation, child support, spousal support, and attorney’s fees and costs. It is not necessary to have any grounds for divorce in the State of California since California is a “no fault” divorce state. “No fault” means that the spouse or domestic partner who is asking for the divorce does not have to prove that the other spouse or domestic partner did something wrong. To get a divorce, one spouse or domestic partner only needs indicate that “irreconcilable differences” have arisen in the marriage. One can also obtain a divorce by claiming permanent legal incapacity to make a decision, if appropriate. 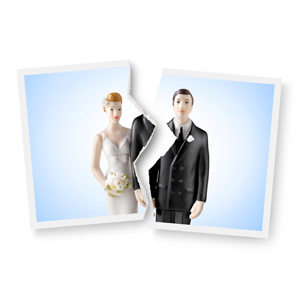 In San Diego, divorce lawyers will work with any person filing a dissolution of marriage. Where do I file for a divorce?One of the common mistakes that people make in filing for divorce is thinking that they must file where they were married. This is not true. In fact, most divorce petitions are filed in the county where the filing spouse resides. If either spouse has resided in California for 6 months prior to filing and in San Diego County for the 3 months prior to filing, the petition for divorce can be filed in San Diego County. Overall, it is important to determine if the Court has jurisdiction over a case; otherwise, if the case is improperly filed it may be dismissed by the Court. A divorce attorney in San Diego County can help you determine if you are eligible to file your case in San Diego County. Note: In order to file a divorce with California divorce lawyers, it is required that one spouse have California residency for six months and residency for a minimum of three months in the county in which they want to file. If you and your spouse have lived in California for six months but have lived in different counties for at least three months, the divorce may be filed by either party in their respective county. How do I end a domestic partnership? Since January of 2005, if you want to end a registered domestic partnership, you must also file for a dissolution of marriage (divorce), legal separation or annulment to terminate the domestic partnership. For domestic partnerships registered in California, the parties have automatically agreed to the jurisdiction of the California courts whether or not they ever lived in California or if they moved out of California. There is no residency “time” requirement. For domestic partnerships not registered in California, in order to seek a divorce in California, one of the partners must have lived in California for six months and in the county where they intend to file their petition for the last three months. Domestic partners may not have the same rights as married persons if they leave California. This is important for parents to consider if they have children and need child custody and visitation orders and child support orders. There are more than 1,000 federal laws in which marital status is a factor. These include rights under Social Security, Medicare, immigration law, veterans’ benefits and federal tax laws. No, the Court does not give any preference to the first person to file or a disadvantage to the person who responds to the case. What are the options for handling my divorce with or without attorney representation? Full attorney representation: In San Diego, you can hire a divorce lawyer to help you understand your rights and duties and represent you in all aspects of your divorce and in court. Limited attorney representation: Hire an attorney who will assist you at particular stages of your divorce. Mediation: You and your spouse can reach a negotiated resolution with the assistance of a mediator in a nonadversarial setting and without going to court. Self-representation (pro per): You can act as your own attorney. You may also get help with paperwork at the Court’s Family Law Facilitator Offices, either individually or through their divorce workshops. Check the Superior Court website for locations and times at www.sdcourt.ca.gov. Please note however, that if you intend to use the services of the Court's Family Law Facilitator's Offices, you may often have to spend the entire day in the courthouse as they will assist people on a first come first serve basis. What happens once I am ready to file a divorce petition at the courthouse? If you live in the San Diego area, you or your divorce lawyer may take the dissolution of marriage forms to the Court with the appropriate filing fees or waiver of the fees with proof of income. The Court may grant or deny your request for a waiver of fees. If denied, you will be required to pay the filing fee. The person who files the divorce case or lawsuit is called the petitioner, and the person who answers is called the respondent. The petitioner may not serve (legally deliver the paperwork) to the respondent. The person doing the service must be over the age of 18 and not a party to the action. There may be other ways to serve the respondent other than personal service, but it is necessary to research or talk to an attorney about what is acceptable to the Court. Once served, the respondent will have 30 days to file a response to the petition. If the respondent fails to file a response with the court, then the petitioner may take the appropriate steps to file a request to enter a default against the Respondent. In order for one party to get a default judgment, they will have to show the Court that the other party was properly served. One of the major factors in how the divorce case will proceed involves whether the paperwork was properly filed and served and if the respondent answered. There is a wealth of information concerning dissolution at the Judicial Council of California website. How do I know if I am divorced? The earliest a divorce can become final is six months and one day from the date the respondent was served. However, simply because this time has passed does not mean you are automatically divorced. Rather, you must have a judgment signed by the Court to complete the divorce process. There have been circumstances where parties remarried thinking they were divorced merely because the six months and one day had passed. What if I am an immigrant in the process of seeking legal status in the United States? For individuals with uncertain or pending immigration status, it is important to consult an immigration attorney, since divorce, separation or annulment may impact your immigration status. How will my military status impact my divorce case? If one or both partners are in the military, certain rules may apply, especially if one party is deployed. You should consult with a San Diego divorce lawyer to further discuss your rights under the Servicemembers Civil Relief Act. The term “domestic violence” is generally used to include a current or former spouse, domestic partner, girlfriend, boyfriend or someone with whom you have a child, a dating relationship or intimate relationship. It is a cycle of violence that often only gets resolved through legal action and a family law attorney or lawyer. Sometimes, in cases of repeated and/or consistent domestic violence, the victim believes they have no recourse and they will strike back and harm or perhaps kill the abuser. In many jurisdictions, a case will now go forward with charges by the prosecuting agency/family law lawyer even if the victim is unwilling to press charges. A victim may be subpoenaed to testify under oath whether or not they want to do it. What should I do if I am in an abusive relationship? If you are in immediate danger, call 911 and explain the situation. The police department will respond to your call. Additionally, a police officer can contact a judge any time of the day or night, and the judge can issue an emergency protective order (EPO) if there is an “immediate and present danger” for you and/or your children. The EPO will prohibit the batterer from coming within a certain distance of you and your children. The EPO will remain in effect up to seven days, allowing you time to go to court to request a temporary restraining order, commonly called a TRO, and to contact a family law attorney if you choose to do so. A restraining order is a protective court order making it unlawful for the individual served to have any type of contact, communication or surveillance of the protected parties named in the restraining order. To get a protective order, you must file an application at your local family law court or with a lawyer, and there is no charge to file. You will need to present evidence to the judge such as photos of damaged property or personal injuries, police reports, medical records, threatening or excessive text or voicemail messages, declarations of witnesses or prior violations of restraining orders or TROs. The restraining order goes into effect once the abuser is served with a copy of your court papers. You can request that a local law enforcement agency serve the court order free of charge. It may also be served by someone who is at least 18 years old and is not protected by the order. The TRO lasts until your next court date, which is three or four weeks after the TRO went into effect. During that time, the person served with the temporary restraining order will have time to file a response with the court showing their side of the story and saying why they disagree with the terms of the restraining order. They may also ask the judge to make other rulings concerning the case. When there are issues of child custody or visitation, the judge may order mediation prior to making permanent court orders. At that time, the judge will decide to continue, change or cancel the temporary restraining order. The final order could last for up to three years. Only a judge can change or cancel the order. If a party served with the TRO does not respond by filing an answer and does not show up at the restraining order hearing, the Court may issue a permanent restraining order, which may be the same conditions as the TRO or different. If different, the person being restrained must be served again, showing them the exact terms and conditions of the permanent order. Violating these terms may lead to an arrest. Having a restraining order issued against you is serious and will alter your life. You may be ordered to move out of your house, stay away from your children or pets or not contact or go near the persons protected by the court order. Additionally, you could be ordered to follow certain child custody and visitation orders. You may be allowed to see your children only during a visitation supervised by a third party, or not at all. You could also be ordered to pay child or spousal support or other bills. You will not be allowed to purchase, possess or use any firearms. If married or in a domestic partnership, the restraining order does not dissolve this relationship. These issues must be handled separately by a family law lawyer and in family court. Domestic violence batterers may be ordered to get help from court-approved intervention programs. When a party violates a protective order, or when there are a series of escalating domestic violence incidents or just one serious incident, the District Attorney may file a criminal protective order against the person committing the abuses. This type of order will demand that the abuser not go near you or the protected children, nor may they possess a gun. This type of order will not address issues such as child custody or visitation. These must be handled in the family court arena, and are often represented by a family law attorney with experience in these situations. Whenever a party violates a protective order such as a TRO, restraining order or criminal protective order, they are subject to arrest. Only a judge can issue or rescind a criminal protective order. If you call the police because of a violation of any type of protective order, and they do not make an arrest, you may ask the DA to file criminal charges. Are there other types of protective orders? Yes. There are civil harassment restraining orders for people not meeting the necessary relationship needed for a domestic violence restraining order. This type of restraining order may be used against a neighbor, former friend, fourth cousin, et al. Additionally, there are elder abuse restraining orders protecting adults over the age of 65 or a person between the ages of 18 and 64 who has a mental or physical limitation (i.e., a dependent adult). Abuse may take the form of neglect, abandonment, abduction or isolation, and may be physical, financial, mental or emotional abuse. These cases are handled through the Civil Division of the Superior Court. Legal separation is a process where the parties wish to resolve everything involved in a divorce except for the parties' status. When the legal separation is granted the parties are still married and cannot remarry until either party returns to court to request a divorce or one of the parties dies. A spouse may petition for a legal separation, usually on the same basis as for a divorce. In a legal separation, all things associated with divorces are also addressed such as requests for child custody and visitation, spousal support, child support and division of property and debts orders. The petition can be assembled by a San Diego family law attorney knowledgeable about legal separation. Typically parties decide to get a legal separation instead of a divorce because of religious reasons, or other personal reason. A marital settlement agreement is a contract between spouses or domestic partners that can be assembled by family law attorneys. It spells out the terms of the divorce. These agreements usually cover property division, child custody and visitation, child supports, debt division, spousal support, attorney fees and costs and any other relevant issues related to the divorce. Family law lawyers can help in the negotiation and preparation of Marital Settlement Agreements. They can provide legal guidance so that you are aware of what your legal rights are before agreeing to anything. If you have no marital property, no joint debts and no children, you probably don’t need a marital separation agreement. However, if you want to provide for the future governance of your relationship, as well as provide additional evidence to the court about the day that you separated, you should have a marital settlement agreement. An agreement leaves no doubt about the details of the ending of your marriage relationship. Because it is better to have a clearly written agreement, rather than rely on verbal understandings, many clients elect to hire family law lawyers or attorneys who specialize in these arrangements. Paternity is the legal establishment or the acknowledgment of the relationship of a father or mother to his or her child. While the identity of a child’s biological mother is usually easy to establish, the father’s or second parent's identity may be more difficult to determine, which is why a family law attorney is helpful. For married parents, the husband is typically assumed to be the child’s legal father. For parents who were not married at the time the woman got pregnant or when the child is born, the child may have a biological father but does not have a legal father until parentage is legally established. Unwed mothers will be asked to provide the name of the birth father when the birth certificate paperwork is being completed at the hospital. However, unless the father is present at the hospital and signs a "declaration of paternity" the father's name will not appear on the child's birth certificate. When and why should paternity be established? Paternity should be established before birth, at the time of birth or as soon as possible afterward. It is relatively easy to establish paternity at the time of birth at the hospital when the birth certificate information is being taken, and establishing parentage at that time helps the parents to avoid future court processes and fees as well as fees from the family law attorney. Establishing paternity before or at the time of a child’s birth ensures security and protection of legal rights for the child. Paternity issues often arise in cases involving child support, but they can also be important in relation to adoption, inheritance, custody and visitation, health insurance, social security and other issues. For example, if the father should die before paternity is established, then the child may lose rights to his life insurance proceeds or forever be barred from collecting the father’s social security or veteran benefits. In addition to all of this, the Court will not make any orders related to child custody, visitation or support until the parentage is legally established. So, for many reasons, it is important to establish this relationship. What does it mean to be a “presumed parent”? The law will presume a person is a child’s other parent, with all of the rights and responsibilities, when certain circumstances exist. These presumptions that apply to married couples also apply to those who entered into a registered domestic partnership after January 2005, but again, be sure to check the laws on these matters since they are constantly evolving and are complicated. Hence, it is probably best to consult with a family law attorney. According to the website of the California Administrative Office of the Courts, these are some of the circumstances where a man is presumed to be a child’s father. What is a declaration of paternity (DOP)? This is a form the parents voluntarily sign to acknowledging the legal father of the child. It is a legal form that may be signed in the hospital when the child is born or afterwards. The signing of this form by both parents will establish the father–child relationship without having to go to court. When the DOP form is signed at the hospital, staff in the hospital shall witness the signatures of parents signing a voluntary declaration of paternity and shall forward the signed declaration to the Department of Child Support Services within 20 days of the date the declaration was signed. A copy of the declaration shall be made available to each of the attesting parents. Unmarried parents who sign the acknowledgment of paternity form help their child gain the same rights and privileges of a child born within a marriage. These rights may include financial support from both parents, access to important family medical records, access to the noncustodial parent’s medical benefits, and the emotional benefit of knowing the identity of both parents. A voluntary declaration of paternity shall be recognized as the basis for the establishment of an order for child custody and visitation or support. What if there are issues of domestic violence? In this circumstance, the mother should contact a family law attorney to inquire about her rights and seek advice as to how to best protect herself and her child. Typically, there are resources available for her at the hospital that may include information about battered women’s shelters, seeking a restraining order through the courts, consulting a social worker or crisis hotline, or getting help or shelter from family or friends. How may a father be named as a child’s parent without signing a voluntary DOP? A petition to establish a parental relationship will be filed with the court along with a summons that must be served upon the father. The petition may also be filed by the father and served upon the mother. This will start a court process to establish a paternity and open the door to allow the Court to determine matters such as child support, custody and visitation. What happens when a man disputes the allegation that he is the father of a child? If a man doubts his relationship to a child, then he may request a genetic or DNA test that will determine, without a doubt, whether he is or is not the child’s biological father. When the Court is attempting to determine paternity and orders the testing, it must be done by court-approved agencies, and the cost may be very expensive to the parties. Generally, if the test is ordered by the Child Support Department, then the parents will not be required to pay for it. In San Diego, fathers may also consult family law attorneys for clarification. Can a woman get child support without the establishment of paternity? No, paternity must be established before child support can be ordered. A woman may start the paperwork to establish paternity when she is pregnant, but the local child support agency can open and pursue the case only after the child is born. If the man believed to be the father denies that he is the father, a genetic test (aka paternity test) can be ordered after the baby is born. Genetic tests can be scheduled through the local child support agency. Once parentage is legally established, parents are required by law to financially support their children, and failure to do so is against the law. Women sometimes seek the counsel of a family law attorney to guide them through what can be a complex process. What if the father leaves the state before it is proven that he is the father? The local court may use information they have to decide paternity without him. If paternity is established without the alleged father’s cooperation, the Court may order him to pay child support no matter where he lives, even if he is outside of California. Additionally, the local child support agency may request a paternity test be done through a court order in the other state. Also, a father living in California or in another state may voluntarily sign a declaration of paternity and willingly accept his obligation to support his child. The baby’s father is unemployed. Should I try to establish paternity? Yes. If you do not establish paternity, your child will not be able to get child support or health insurance or other benefits previously mentioned, even after the alleged father is employed. If a person signed a voluntary declaration of paternity and is later determined not to be the father, then may he change his decision? Either parent may rescind the voluntary declaration of paternity by filing a rescission form with the Department of Child Support Services within 60 days of the date of execution of the declaration by the attesting father or attesting mother, whichever signature is later, unless a court order for custody, visitation or child support has been entered in an action in which the individual seeking to rescind the declaration was a party. Additionally, a man may file for a hearing with the Family Court to set aside his voluntary declaration of paternity. This action may also be taken by the mother or the local child support agency, and can be filed in San Diego courts by family law lawyers. The Court may set aside the voluntary declaration of paternity based upon the results of the genetic tests performed, if the man who signed the voluntary declaration is not the father of the child. They could also deny the request to set aside the DOP if it determines that the decision is not in the best interest of the child. The Court will consider many issues before making this determination. For unmarried parents, what is required to put the father’s name on the birth certificate at the time of birth? Hospitals will generally require the acknowledgment of paternity form signed by both the father and mother along with the signatures of two witnesses who are unrelated/uninterested parties. If a woman knows that a man is not the father of her baby it is illegal for her to name him as the father. For unmarried parents, may a father’s name be added to the birth certificate at a later time? Hospitals will generally require the declaration of paternity of paternity form signed by both the father and mother along with the signature of witnesses who is an unrelated/uninterested party. If a woman knows that a man is not the father of her baby it is illegal for her to name him as the father. May a father’s name be removed from the birth certificate? Yes, a father’s name may be removed, but it will require a court order. All changes to a birth certificate must hold up in a court of law, unchallenged as to their accuracy and reliability. Additionally, when a birth certificate is changed and the new birth certificate is issued, all documents supporting the changes are sealed by the California Office of Vital Records, and they will not be made available to the public. Should a family law attorney be consulted for paternity issues?Decisions made by individuals, families and the Court surrounding the issue of paternity will impact lives for many years and should be given serious consideration. There may be statutes of limitation and/or periods of time during which certain actions must be taken. A prudent person will seek legal help and/or legal representation from a family law attorney, especially if they have questions or doubts. The paperwork may be complicated and difficult to understand, and it is very important that it is done correctly. Always be sure you understand any paperwork you sign. For a consultation on these issues, you may wish to call the Lawyer Referral Service at 619-251-8585 to be referred to a San Diego family lawyer. Can spouses and partners work out an agreement without going to court, and how can a family law attorney assist in this process? Yes, parties may work together to write up a spousal or partner support agreement or stipulation that both parties will sign and then submit to the court for the judge to sign. The Court will file the original paperwork, and it will be binding, according to spousal support laws, upon the parties unless modified. While a family law lawyer is not required, an attorney understands how to most effectively apply alimony law to help obtain and manage spousal support agreements. What to Discuss with Your Lawyer? What are the expected timelines for resolving my case? How can I protect myself and my finances during the divorce process? Child Abuse Crisis House, Inc.